Figuring out how to acquire new customers is difficult. I've spend the past few years working with all kinds of different businesses across a range of industries to help them figure this out. Now I'm going to share a whole host of tactics that you can try out yourself to add more to your bottom line. Having a solid customer acquisition strategy is an essential component for any business. Without it, you're going to seriously struggle to grow your business in any kind of meaningful way. That said, one of the most difficult parts of scaling any business is actually figuring out which channel is the most sustainable for bringing through new customers. Justin Mares made a very good point in his book (co-authored with Gabriel Weinberg), Traction, in which he says, "Phase 1 [of gaining traction] is very product focused and involves pursuing initial traction while also building your initial product. This often means getting traction in ways that don't scale." This often means getting traction in ways that don't scale. Paul Graham, of Y Combinator, also echoes this point in his essay aptly titled, Do Things that Don't Scale, where he describes a tactic that Stripe used in their early months - that he dubbed, Collison Installation - where they would physically install Stripe onto potential customers laptops for them. The other thing to bear in mind is that an acquisition channel that works for one business may be terrible for another. At HubSpot, organic search is a huge channel for us. We’ve based most of lead generation around ranking for relevant long tail keywords that deliver millions of new visitors each month. Conversely, if you take a company like Slack as an example, organic search just isn’t as much of a huge channel for them. Most of their customer acquisition comes from viral marketing; that is one user coming into Slack and inviting other members from their business. Another overused but obviously relevant example of this can be seen with Dropbox’s early growth. Their incentivized referral program (invite a friend and get more storage space for free) led to new customer acquisition exploding. Similar to Slack, organic search wasn’t really a big channel for them. There are a ton of different frameworks that have been published that seek to help you identify the right channel to pursue, but ultimately this comes down to a fair amount of trial and error, especially if you have no historical data to work with. I’m not going to delve into the details of a framework, per se. Instead I’m going to give you a host of customer acquisition tactics, as well as a way to test them out, in order to enable you to get a feel for which channels have the potential to deliver the most value. Before you start experimenting, make sure that you’ve set clear goals that you’d like to achieve – even if you don’t have much data to base them on. Simply setting goals here, albeit rough ones, will enable you to actually understand whether something is working on not. After testing out a few different channels you’ll be able to compare their individual success in relative terms against each other. The final thing to note here is to come back to the quote I shared from Justin Mares (above). It doesn’t matter if you can’t figure out a way to scale these individual tactics right now. Instead, you’re looking to see if the channel provides what you’re looking for – large volumes of high-quality new customers. As previously mentioned, the tactics that I’m going to share with you are designed to test something very specific within an individual channel. The idea here is that it can help you either discover new opportunities for growth within an existing channel you’re pursuing or it can open up new ideas within channels you’re yet to utilize. On top of this, I’ve tried to design each tactic in a way that enables a broad set of businesses to test them out. While all of these may not be applicable to you, there should be at least a handful that are. Objective: Increase the number of people reading and engaging with the emails that you send to your subscriber list by specifically targeting those that have failed to open them. How: 48 hours or so after sending an email to your subscribers, go into your email marketing software and find all of the subscribers that received the email but didn’t open it. Resend your email with a completely new email subject to just these people – this gives you a chance at increasing the number of opens of your campaign without looking like you’re spamming subscribers’ inboxes with the same email. I tested this out recently with my email subscriber list and found it to yield an increase of 35.41% for the total number of opened emails, and an increase of 39.66% in click-through rate. That's huge when you put it into absolute numbers. Objective: Generate more organic search traffic to existing content that lives on your blog through improved keyword rankings. How: Within a lot of websites that publish content regularly on their blog, there are often a ton of posts that are sitting really deep in their website’s architecture. This is primarily due to time-based blog feeds – i.e., the older a blog post is, the lower down in the blog feed it will be, until it goes even further down into the various archived pages of the blog. A perfect example of this was with the HubSpot blog. We produce over 250 blog posts every month and we have hundreds of blog feed pages. The blog posts published a few years ago will very quickly drift down into page 30, 40, 50, etc. of the blog, and consequently very deep in the overall architecture of the website. In general, pages deeper in the architecture of a website will get a lower share of internal PageRank. Unless the page has a significant amount of backlinks from external webpages, it’s unlikely to rank very well in the search engines. One quick solution here is to update the date of the blog post to the current day and republish it. This will fire it to the top of page 1 of your blog feed and give it a significant PageRank boost. Not only that, but if you actually add some extra content to the blog post and update any old stats/references, then you can fully re-promote it (via social media, communities, email, etc.) and earn more backlinks from external websites. I’ve used this tactic, and continue to do so, across pretty much every campaign I’ve ever worked on that revolves heavily around content production and have had great results. 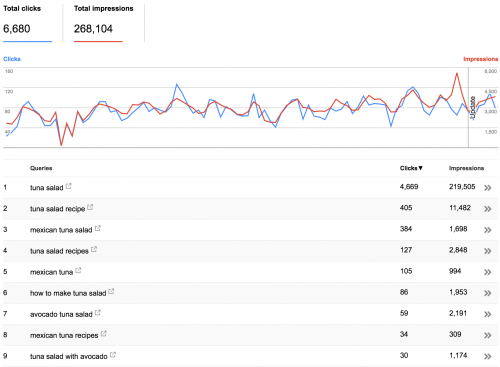 You can see an example of this with the 105% increase in organic search traffic that my colleague, Pam Vaughan, achieved from executing this very tactic. Objective: Increase the number of people downloading content upgrades when they’ve come through to content from organic search. How: Identify the pages on your website that deliver the most organic search traffic, ideally top-of-the-funnel content like blog articles. You can do this within your analytics platform. 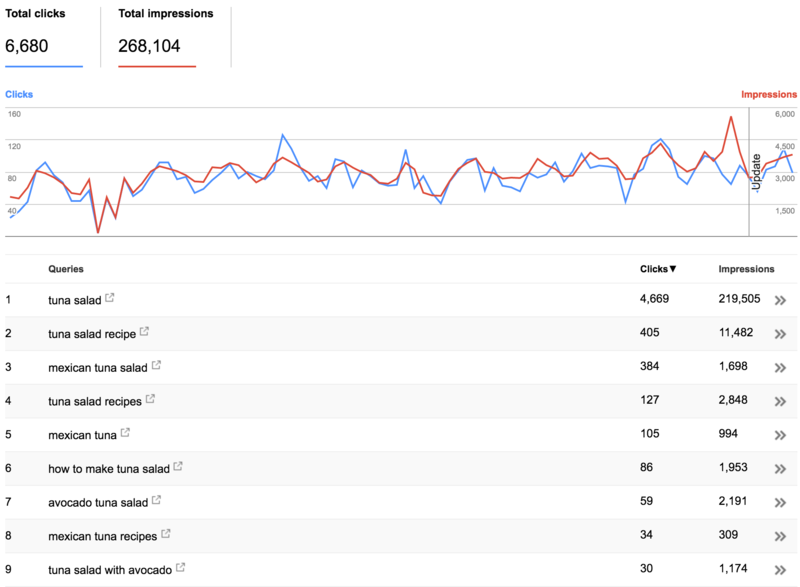 Once you’ve found the top performing content from organic search, use Google Search Console to find which keywords are being searched for most to discover and land on the content. It's easy to do this within Search Console - just filter down on each page using the built-in filter and then select to view the Queries for that URL. You'll then get a list like in the above screenshot. Now that you know what people are searching for to get to your content, you know what they actually want. This is important because you can now create a content upgrade, with the purpose of capturing contact information in return for access that relates directly to one of these keywords. In the above screenshot I show a page that ranks really well for "tuna salad recipe". A logical content upgrade would be a downloadable PDF tuna salad recipe card. We scaled this specific test across around 80 different pages on the HubSpot blog and saw an average increase in conversion rate of over 200%. Objective: Acquire new customers by leveraging the existing user base of products that you integrate with, offering an improved user experience in the process. How: To explain how this tactic can work well I'd like to showcase one of the masters of this: Zapier. For those of you that don't know, Zapier is a platform that focuses completely around connecting apps together in order to create unique value from them. Zapier's whole business revolves around leveraging integrations and it's primarily how they've scaled the business to date. "Doing dedicated integrations can be a good source of early growth if you target the right company. The trick is to build a great integration that fills a gap in another company's product offering that they aren't likely to fill. If possible get their buy-in on co-marketing efforts before hand. Then when you launch the integration make sure your new partner will email their user base and setup a landing page featuring your new integration. Don't expect any integration to make or break your company though. Most integrations get less than 1% penetration into a user base, so make sure to go in with expectations set when building an integration. Of course, this works great for Zapier because we can do hundreds of integrations and the usage is meaningful when done across all of them. But don't expect to have our network effects when you build your integration." The real takeaway here is where Wade talks about integrations that “[fill] a gap in another company’s product offering that they’re unlikely to fill.” An integration has to be mutually beneficial to each partner company while also adding more value for the customer than just simply using the two products independently. Take Stripe’s integration with Shopify. This is an integration that I’ve personally taken advantage of and it has actually been a huge factor in selecting Shopify as a CMS. There have been many other examples of integrations similar to this that have had a big impact on product adoption – another good example is when PayPal directly integrated with eBay. The hard part can often be to find the right integration partner. For an integration to be both appealing to the individual partners and also add value to customers, there shouldn’t be too much overlap in existing functionality. I’d start by figuring out features that your customers would find useful but in areas that you’re not going to actively pursue as a product development priority. The likelihood that their customers would be interested in your product. Their online reach (i.e., email list, social followers, etc.). Objective: Increase organic search traffic with high commercial intent by ranking for keywords related to specific industries and locations that you target, as well as those related to individual features of your product. How: Organic traffic that comes to your website with high commercial intent, i.e., the visitor is actively looking to buy, is probably the most valuable traffic you can generate. That said, it’s often in much smaller numbers than that coming from more informational queries (e.g., “how to do…”). Industry-specific queries. For example, “real estate CRM”. Feature-specific queries. For example, “document signing software”. Location-specific queries. For example, “used cars, Boston MA”. This usually works better for B2B businesses and the goal is to build out a list of different industries that you sell to. Once you have this list, match them up against keywords directly related to your product and analyze total monthly search demand for each within Google Keyword Planner. Content that directly relates to the industry you’re targeting. Testimonials/case studies from customers in the industry you’re targeting. Imagery that prospects from the industry you’re targeting can relate to. Use the keyword in the URL of the page as well as the title tag. 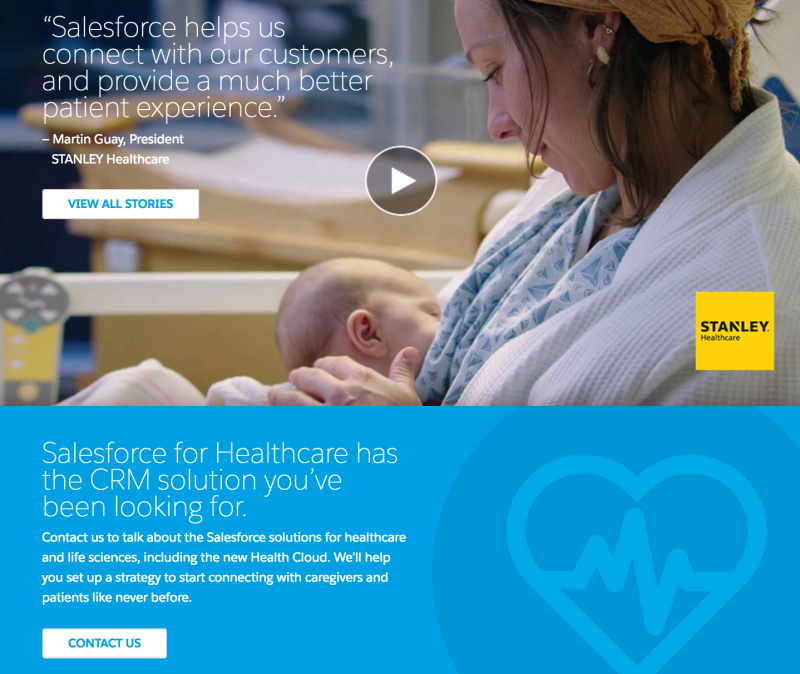 An example of this strategy being implemented well is with SalesForce. They’ve built out a ton of these pages that rank for keywords like, “CRM for nonprofits”, “financial CRM”, "healthcare CRM", "insurance CRM" and "retail CRM". The goal of having feature-specific pages is two-fold. The first part is all about ranking in the search engines for keywords related to specific features of your product/service. For example, let's say your product is a fitness tracker, like FitBit or Jawbone. In this case you'd want to rank well for terms like, "fitness tracking", "heart rate monitoring" and "step counter". These are all features that relate to a solution that a potential customer is looking for. The second goal of these pages is to provide a better user experience for visitors already on your website that will lead to an increase in online conversions. Think of it this way, if you're checking out a product online, would it increase or decrease the likelihood that you're going to purchase it if you're given detailed information about all of the features related to that product. It's a no-brainer. List out all of the individual features of your product. For each feature, outline the problems it solves. Do keyword research around both the features and problems. Stack-rank the most relevant keywords by the highest monthly search volume. Build individual pages for each of the core features, aligning them to the keywords you've researched. Finally, there are location-specific pages. This works particularly well for businesses that operate or serve customers in numerous locations, especially if they're a service-led business. The core premise here is that you'd map out all of the locations that you're targeting customers in and then build out landing pages for each. An example of a company doing this really well is Zillow. Zillow rank for a whole host of location-based keywords that net them millions or organic visitors every month. Take the above page as an example; it ranks #1 for "Austin real estate", "homes for sale Austin TX", "Austin homes for sale" and many more. A modest estimate of organic traffic going to this page alone is 24,000 monthly visits (according to Ahrefs). Each page needs to have unique content on it that's related to the location you're trying to rank for. There should be something inherently linkable about the page. Zillow does a good job here because they give real-time price updates for property in the area, so it actually adds value to visitors. Think about the internal linking to these pages. Building out a hub page that links to each of the locations can be a good start. Consider the conversion path for visitors to the page(s). Objective: Rapidly increase organic search traffic, as well as traffic from a range of other channels, through the acquisition of a relevant website, and consequently their keyword rankings. How: This is my #1 favorite tactic to roll out when I’m working on a project with a brand new domain. It’s seriously powerful for scaling up traffic growth in a short period of time. Not only that, but it can actually work out to be seriously cost-effective. Scope out websites that rank for a large number of long tail keywords relevant to your buyer persona. From the list of websites, drill down on ones that could be potential acquisition targets. Approach the owners of the websites to see if they’re interested in selling and get valuations. Come to an agreement with one of them and acquire their web property(s). Migrate over all of the content from their website into your existing domain and set up canonical tags to point to your version of the content. Once all the content is migrated, set up 301 redirects to push the rest of the website’s content and backlinks to you. You’ll now absorb all of the acquired domain’s traffic while getting an additional SEO boost across your existing content for the large influx of backlinks you’ve just added. Sounds pretty good, doesn’t it? That’s because it is. The key here is picking the right website to acquire. I’m not going to lie to you, this part can be quite tough, but I assure you it’s worth the time investment. Number of pages on the website. Specific keyword rankings (i.e., is the site ranking for a very valuable keyword to your business). Relevancy of the content to your audience (there’s no point buying content that you can’t use). How much revenue does the website generate? Extended audience size (e.g., do they also have a large email subscriber list?). Anyone that owns a website where organic search is an important channel will know that creating content and earning backlinks costs a lot of money. In a recent e-commerce side-project of mine, we were spending roughly $450 per blog post we created, which included custom imagery (important for our niche). In the early stages of a campaign where you want to build out a ton of content, $450 per blog post can really start to add up - more importantly, it meant we had to spread content production over a longer period of time, and ultimately wait a longer time to see results. $28.28 per linking root domain. That's some huge savings. Not to mention the 60,000 monthly visits from organic search that we captured. While there's often a lump sum involved with this play, the benefit you see from economies of scale can be huge, and that's not even factoring in the additional benefits you'll see across your existing content - which is very significant. Once we'd gone live with the migration, not only did we absorb the traffic from the acquired site, but we saw massive lifts in our core target keyword rankings that we were going after - on average they jumped two pages. The above graph shows the uplift in organic traffic after just 40% of the content was migrated over (this is just with canonical tags, too!). Trust me when I say it's very difficult to see this kind of growth in just a couple of months on a new domain. For more details on the technical aspects of a migration like this, read this post I wrote back in 2015. Objective: Generate highly targeted traffic to your content that has the potential to convert against your business goals. How: There are a few ways you can go about this, and it largely depends on both how you want to work with the partner and how targeted you’d like the audience to be. I always start with a campaign idea. Let’s say you’re promoting a free online course that you want to funnel into a paid product – getting this in front of a targeted list of subscribers could result in a ton of subscribers. For this example I’d ideally want to have either a dedicated email sent or a substantial mention within an email. Depending on how prominently you’re mentioned in an email send will impact both pricing and availability. Some brands won’t actually offer a dedicated send but will instead allow you to have a mention within a section of the email. Both can work but you need to decide what would work better for your specific campaign and budget. Next up is finding the right partner. You could use an advertising marketplace like BuySellAds where you simply search for partners based on a few criteria. I’ve done this in the past with varying results, to be honest. How big is your email list? What types of people are subscribes to your list? What’s the typical open/click rates of campaigns you run? From there I’ll get data back from a few different partners and decide on the best one. A little advice here if it’s your first time doing this – start out small to test the conversion rate. Once you have proved it works on a small scale then you can go about scaling it up. Objective: Create a co-branded piece of content that is promoted by both brands to dramatically increase the overall reach of the content as well as leads generated. How: The scale of success will largely depend on how well your product/service compliments offerings from other businesses. The idea here is that you'll partner with another company that has a large reach amongst the audience that you're targeting, but doesn't directly compete with you. A good example of this in the B2C world would be with Red Bull and GoPro. Their "Stratos" campaign, where they worked together to drop a man from the stratosphere, is probably one of the largest co-marketing efforts of all time. On a smaller scale, and in the B2B world, Buffer and BuzzSumo collaborated to produce a study across 500 million Facebook posts. They turned this into a webinar and then shared out the leads that were generated. The beauty of this campaign was the obvious synergy between the two companies' offerings, which is going to result in a much greater yield of leads that can be used by both companies. Make a list of companies that target a similar audience but have an offering that compliments yours. Get in touch with them to find out their total reach (email list size, site traffic, etc.). Work on a content idea together. Create assets, including a landing page on each of your websites. Objective: Acquire new users through a mechanism that enables existing users to bring them into your product without increasing your customer acquisition cost by any significant amount. How: Virality is a term that gets banded around a LOT, and more often than not its meaning is largely misunderstood. The core benefit of having virality baked into your product is that you can scale up new user acquisition without increasing your customer acquisition costs (CAC). There are very few channels where this is the case. Paid is the perfect example because for you to increase user acquisition from paid, you'll also need to increase CAC (more money spent = more users). What you're aiming for with virality is for CAC to remain a constant while user acquisition increases. This is usually through an existing user being responsible for the acquisition of a new user. 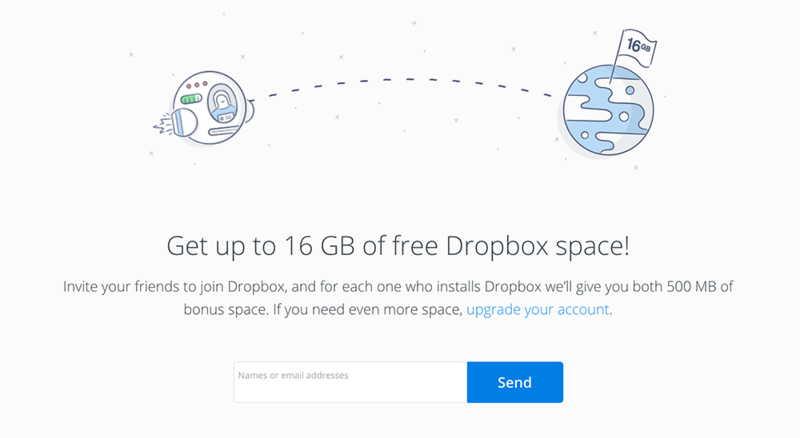 One of the most famous success stories of virality within a product is with Dropbox. Dropbox built in a referral system that meant you'd receive an extra 500mb of storage once you'd referred a friend into Dropbox. Not only that, but the person you referred in also received an extra 500mb of free storage. The fact that both parties gained value from a referral dramatically increased the likelihood that existing users would invite in others. Airbnb is another company that has a pretty good viral mechanism built into their product. They offer $100 in travel credit (to be spent on Airbnb) for every new Airbnb host that you invite and $35 in travel credit for every Airbnb traveler that you invite. 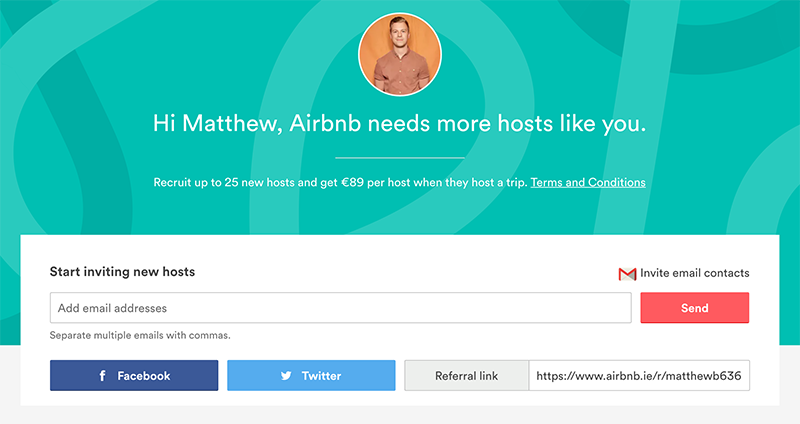 The host that you invite also gets some Airbnb credit, which ensures that there is value for both parties. Another really good example is with MailChimp. MailChimp allow you to use their email platform for free if you have less than 1,000 subscribers in your list. The other caveat is that you have to include a rewards bade at the end of your email. This means that anyone receiving your email will see a MailChimp signup link. Not only does this help to acquire new users for MailChimp, but the user that refers in someone will receive reward points, helping them to discover new features and reducing their likelihood to churn. Ultimately, virality is a hard thing to achieve. One of the things that you will want to do when you're scoping out the possibility of building in some kind of viral mechanism into your product is what the viral potential is. This is usually worked out as a viral coefficient. What features of your product are most popular among your customer base? Do you have any features that have usage caps that could be increased through a referral incentive? By inviting others into your product, would your existing users benefit from any kind of network effect? What can you use as incentives to existing users to bring in new users that will have a minimal impact on CAC? These are just a few to begin with. You're going to want to test out some different approaches with your existing customers, pull in the data and then make some decisions on the most effective tactics to explore in more detail. Get instant access to my extensive list of customer acquisition tools that you can start using within your campaign(s) right away. Objective: Reduce the amount that you're paying per click across your paid Facebook ads while maintaining the same quality of visitors. How: After running a whole host of different Facebook advertising campaigns over the past few years, one of the overwhelming factors that I've observed for increasing ad engagement has been social proof. Ads with lots of engagement on them (e.g., likes, comments, reactions, shares, etc.) are typically clicked on a whole bunch more than those with either a small amount or none at all. Option 1: Run your ad only to your Facebook page fans initially and include a CTA within the copy to comment. Option 2: Do the same as above except run it to your website visitors using a custom audience. Option 3: Target ads to countries with super low CPC (e.g. Philippines, Brazil, etc.) to seed initial engagement. If you're using option 3, make sure you filter out any obvious spam. To be honest though, people rarely read the comments on an ad; it's more about there being "X comments" on your ad than having nothing at all. Once you've seeded initial engagement, which should all come at a much lower cost to you due to the finer targeting, tweak the copy of the ad and change up all of the targeting, and I guarantee that you'll see a much higher CTR and lower CPC. Here's a useful resource that's related to this around creating Dark Posts for your ads, which is basically a way to lock in and consolidate trust signals even during split testing. Objective: Generate new customers through incentivized referrals. How: There's two ways to look at affiliate. The first would be your traditional affiliate program where you give an individual, maybe a blogger, a unique referral link and then every time someone signs up to your product from it, you pay them. The other way could be driven more by business development partnerships. Let's say you integrate your product with another company's product. Then, every time someone signs up to your product as a direct result of the integration, you could give a payout to your integration partner. The maximum payout you can give to affiliates to retain a profit. The system that you will use for tracking affiliate referrals. Who would be interested in being an affiliate for your company. Running a successful affiliate program can offer a ton more benefits than just your conversion goals. Ultimately, for affiliates to build revenue they have to talk about your business. This can have a really positive impact on a bunch of other acquisition channels outside of affiliate. There's a bunch of different affiliate software out there for you to roll out your own affiliate program, including Post Affiliate Pro, OmniStar and Ambassador. On the other hand, you can plug into pre-built platforms that will advertise your program to their network of affiliates. Some examples of these platforms include, ShareASale, ClickBank and CJ Affiliate. Here's an example of AdEspresso's affiliate program details so that you can see an example of a SaaS business affiliate program in action. You don’t just want every affiliate under the sun, you want affiliates who are likely to attract the right customers for the right reasons. If you don’t get this right, you could end up with a bunch of users who require a high support burden, are more likely to churn, and have a lower lifetime value. As such, you need to identify potential affiliates in your space, and home in on the ones whose audience matches your target market, and whose message aligns with yours. Build out personas for these affiliates, think about how you are going to attract them, incentivize them, and retain them (where retention means: ‘promoting your product on a continuous basis’). Similarly, you really need to manually vet your affiliates, and make sure applicants tick all the right boxes. One way to do this is to ask them to fill in questions during the sign-up process, such as ‘How do you plan to promote our product?’ If you don’t think the applicants are a good fit (e.g., they just have a coupon website), then don’t feel bad about rejecting them. One you have the right affiliates on board, it is just a question of making sure that they have all the resources they need to do an awesome job of selling your product!" Objective: Gain a better understanding of which keywords drive the most conversions from search and place more focus on ranking for them in organic. How: Keyword research can be a confusing task for a lot of people that haven't immersed themselves in SEO for a substantial amount of time. As a result, a lot of the priority that's placed on ranking for specific terms can end up being ill-conceived. An example of this is making an assumption that ranking for a broad, informational query with a large monthly search volume will drive huge amounts of revenue. I've seen this first-hand with a bunch of businesses I've worked with, but a recent example was with the term "CRM". We spent a bunch of time at HubSpot going after the "CRM" keyword to drive new signups to our free CRM, and once we ranked on page 1 we soon realized that this keyword contributed less signups than others with 100x less search volume (literally). The main reason here is that there isn't any commercial intent behind the keyword. Most people searching for it just want the definition of the acronym. Pull a list of your top keywords that you're planning on going after. Run a small scale paid ad campaign through AdWords. Measure the conversion rate on a keyword level. Prioritize your organic search focus based on the keywords that convert best. Objective: Generate qualified referral traffic through to your website by answering relevant questions on Quora.com. How: For those of you that haven't used Quora before, it's a question-based social network. In short, lots of people ask lots of questions, then lots of people answer those questions. The questions and answers span across all kinds of topics, from the meaning of life through to what happens when you don't cut grass. The opportunity from an acquisition point of view is to funnel traffic through to your content by commenting on questions that your content answers. Jason Lemkin, CEO of SaaStr, has answered over 2,000 questions on Quora and generates over 1,000,000 (yes, 1 million) views on them every month. Here's how you can go about scoping out the right question to answer that will get you the largest return on your time. Log in to SEMrush and do a search on quora.com. Navigate to the "Organic Research" tab under "Domain Analytics". 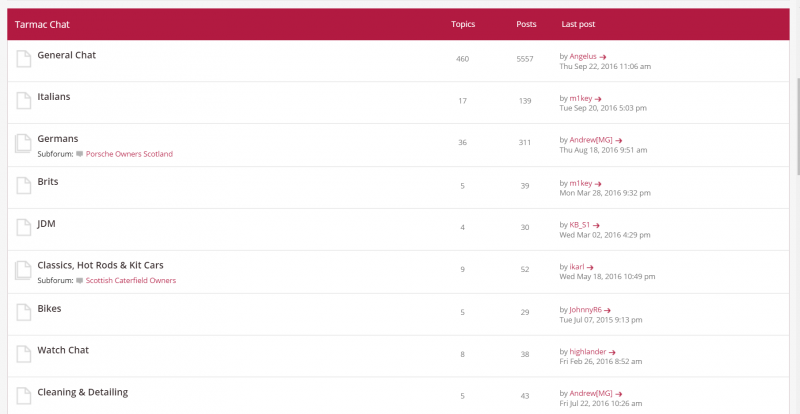 You'll now have a list of top ranking questions on Quora (within the search engines). Run a search for a keyword related to your content. For example, "SaaS". Now sort the results in descending order by search volume. You'll now have a list of all the relevant questions on Quora (within the URL column) that drive regular organic search traffic. These are the questions that you can prioritize for answering. When it comes to actually answering the questions, try to avoid just posting a link to your content. That won't fly with the Quora moderators and they'll remove your answer in no time at all (trust me, I know). It's okay to put links within your answers but try not to do this too much. Every answer you publish should have inherent value without having to visit anything else. It's also worth building up some goodwill within the community by answering some questions without any links at all. This is really a longer term play, but as is shown above, it can pay off big-time. Objective: Earn backlinks, press coverage and traffic to your content. How: Investing big on content can often be a risky move. Simply pumping more money into your content marketing won't necessarily get you results. In the same vein, not committing enough is likely to yield much. That's why focusing your efforts on bigger plays can be a better strategy to follow. If you're looking to earn mentions in top publications and generate all the traffic that comes with that, sourcing original data is one of your best bets. Journalists love original data, especially if it can be used to tell a wider story. Add to that the right timing and you're onto a winner. 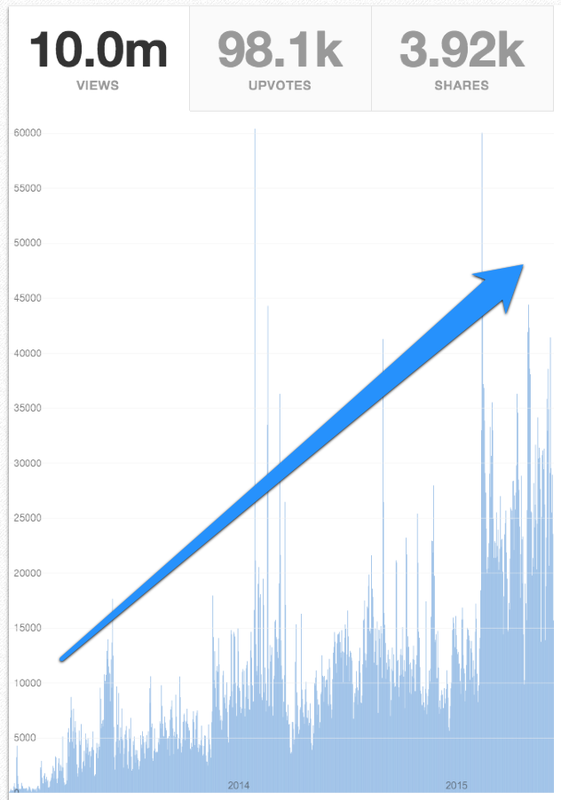 The above chart shows the traffic over a two-week period for a single piece of content that we launched, producing over 100,000 unique pageviews. Not only that, but it also netted over 500 backlinks from over 300 different domains. This includes the likes of TheNextWeb, Inc, Android Authority, Games Radar and Capterra. This was all through creating a piece of content based off of data. It makes getting attention from journalists and big sites so much easier, and the boost in traffic and links has a huge knock-on effect across your whole site. Contrary to popular belief, this doesn't need to cost huge amounts and it isn't just for big brands - trust me, I've done this for brand new startups and big brands alike. Figure out a topic relevant to your buyer persona/offering. I'm not going to dive too much into this but the main takeaway is to try and keep your idea relevant in some way to your business. Find a specific question you're going to answer within that topic, using data. To us the above example, "How much revenue does the Pokemon Go app generate?" Figure out the data points you will need to answer the question. Map out how to gather this data. Will you need to do some secondary research (i.e., you'll be patching existing data together to make it more valuable cumulatively) or do you need to conduct primary research (e.g., running surveys through services like PollFish)? How can you add credibility to the data? One good way to do this is by getting sector experts to give a quote around your findings. A nice way to do this is to search the New Releases section of Amazon to find recently published authors and reach out to them for a quote (having a quote from a published author goes a long way with journalists). Thanks to Kirsty Hulse for that tip. Visualize the data. Try not to overthink this part. Don't just create some crazy interactive piece because you think it's 'cool'. Format the content into something that will make the takeaways easy to digest, and in a way that the target reader will find easiest to consume. Reach out to the press with some exclusives on the data before you go live. You can use a tool like Lumanu or JustReachOut.io to find influencers/journalists to reach out to. "It's no secret that if you have data, you have news, and if you have news, you have links. Though getting access to statistically significant, not outrageously expensive survey data can be incredibly difficult. The good thing about working on the internet, however, is that there are pockets of weirdos interested in everything. And I mean everything. For example, here is an active forum for Pest Control Experts in the UK or these having a conversation about chamber music or these absolute lads enjoying "tarmac chat". 5,557 posts in general tarmac chat. Sure. The point is, whatever your niche, whatever your brand, there is a community of people actively interested and engaged in it. These are the people you should be sending your surveys to. (I found these simply by Googling [thing] + forum). A few weeks ago I also discovered Pollfish and they literally revolutionized my life (that's the kind of life I lead). It's a survey and market research service, but it's fast, it's affordable and has lots of different question formats and demographic and screening options." Objective: Increase the number of leads you generate through the creation of highly relevant, self-qualifying tools. How: I can't stress the importance of relevance here. The number 1 mistake that I see businesses make when they try to execute this strategy is to build a tool that generates a lot of traffic but either bears no relevance to their business or it doesn't inherently qualify leads. When I talk about the tool being self-qualifying, I'm referring to the fact that it would only be useful to users that would also get use from your product/service. A good example of this is HubSpot's Website Grader. 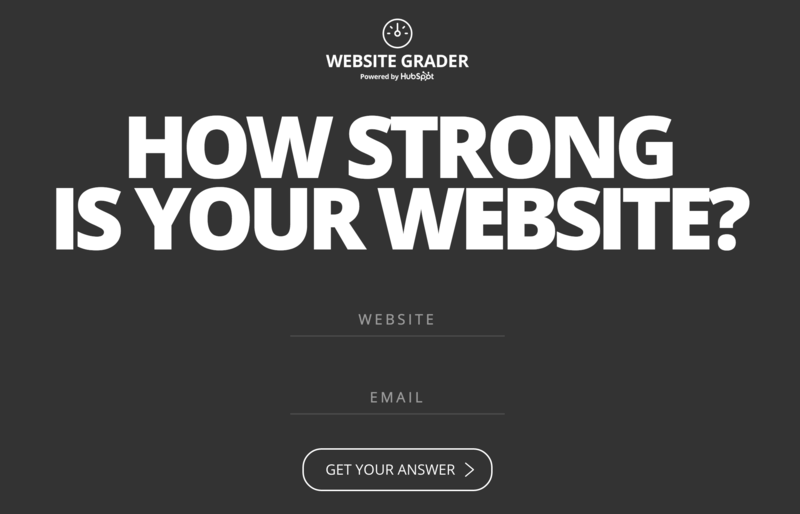 The tool grades the performance of your website based on a variety of inbound marketing metrics. You'll get a report sent to you that outlines areas for improvement, as well as the things you're currently doing well. Coincidentally, HubSpot's marketing software is likely to help you improve on those areas you're lagging in. Not only that, but the sales team now have a bunch of data on your current setup that will enable them to sell better to you. A great lead generation tool will combine the ability to gather essential data on the prospect in order to improve the likelihood of a sale, as well as fulfilling a core pain point of the prospect. In this example, the pain point is that a lot of marketers struggle to figure out how well their current website is performing. Outline some core problems that your buyer persona has. List out the most essential data points you'd need from a prospect to sell to them (email, phone, etc.). List out 2-3 basic solutions to the core problem that your buyer persona has (from step 1). Identify any of the solutions from step 3 that could be automated in some form. For those that can be automated, list out the steps to automate each (in detail) and work this into an ideal for a tool. PIE score each idea and stack rank them highest to lowest to prioritize which to look at. Try to figure out ways to get the data you need from the user in a way that feels part of the whole experience. Don't underestimate the complexity of this process. More often than not, the best tools are the simplest, but it takes a lot of work to get to the stage where you can make a simple idea work. Objective: Increase the volume of relevant traffic to your website, while boosting your organic search rankings. How: 'Guest blogging' gets a bad reputation, especially within SEO, because of the fact that so many companies have been doing it to death. More to the point, focusing on large volumes of low-value guest blogs in an attempt to build links. For any of you involved in SEO, or that have rolled out guest blogging campaigns, you'll know that this doesn't scale well at all, and it's VERY difficult to get a return on your time. So just to be clear, what I'm about to go through is not focused around pumping out a bunch of crappy content to low authority sites in order to build links. What I am suggesting is working with blogs/publications that have a hyper-relevant audience to you and the ability to refer traffic to you. Forget looking at things like Domain Authority to decide whether you should be publishing content on a site. Forget about whether you're going to get a dofollow link from the website. Forget sending 1,000 outreach emails to websites to see if they'll accept a blog post from you. Trust me, I've been down the road of the above and it doesn't play out well. Does each post on the website get a significant amount of engagement? i.e., comments, shares, etc. Is their audience full of my buyer persona? Do I think that this will result in any kind of meaningful referral traffic to my website? You may be thinking, "A few of those seem like they'd take a while to evaluate." Well, that's because this process takes a little time. The more time you spend doing it, the better the results that you'll get. Instead of writing a piece of content and pushing it out to a bunch of different websites, spend time crafting a specific piece that is tailored completely to the audience of the site you're going after. On top of that, put time into pitching the idea. Figure out specifically who within the business is the decision maker. Can you get an intro from someone you know? If not, can you build a relationship via Twitter or LinkedIn first and add some value before you ask for something? Ultimately, the worst that they can say is no. If that's the case, you can always publish this on your own website. Outside of pitching to publications, you can publish content to platforms that enable you to have an account with publishing rights. For example, Medium or BuzzFeed. I'm not going to go into all the details of this here because I wrote a huge guide on reaching the front page of BuzzFeed a while back. All I'll say here is to take a similar approach to the above where you're looking to add as much value to the individual platform's audience. Objective: Give your existing content a boost of traffic by tapping into Medium's referral engine. How: Medium released a pretty amazing feature within their publishing platform in late 2015 that seemed to go under the radar of a lot of content publishers. They gave the opportunity to add a canonical tag to the content you publish on Medium. This means that you can republish your existing content from your website over to Medium and any backlinks that the medium post gets will be pushed back through to your original post; and you don't need to worry about content duplication. How do you do this? Well, it's really simple: the "Import a Story" feature. Click on the button and then add the link to your existing piece of content. Medium will work it's magic and start formatting your content into their platform, automatically adding a canonical tag. 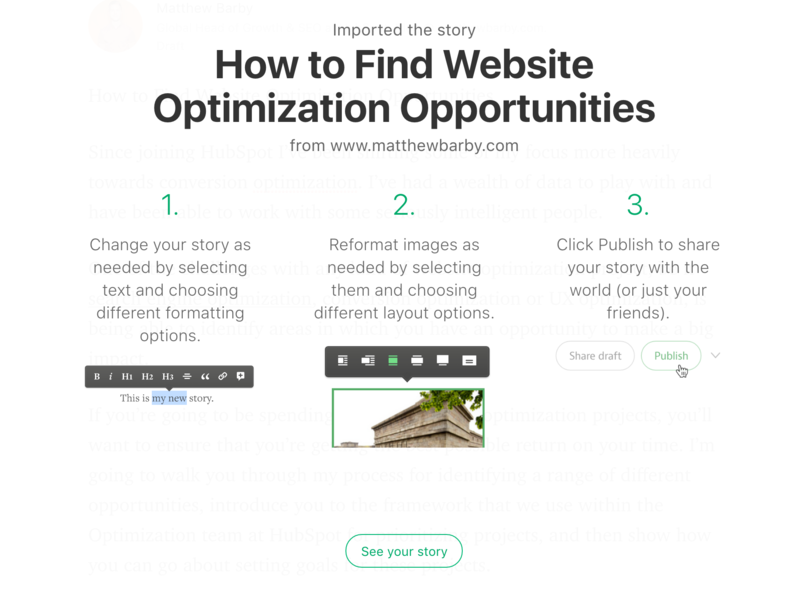 If you've started to grow a following on Medium already then you should be able to get a huge boost in traffic to your content by republishing it. Realistically, you have very little to lose in doing this. Medium's referral engine has the ability to get a lot of eyeballs on your content too, so I'd recommend taking some of your content that you think will be most suited to Medium and importing it. Just make sure you take the time to tweak any formatting. If you're completely new to Medium, I'd recommend reading this beginners guide from Buffer. Objective: Identify the physical locations of your target market so that you can align localized campaigns more effectively. How: This tactic first came about in a campaign that I ran a few years ago where we needed to figure the high concentration areas of where customers were located in order to align a bunch of offline experiential ads in the most effective positions. On top of this, this data can be gold for your sales teams, especially if it's in a format that's easy to consume. For B2B businesses, this can be a really useful technique to implement, even if you don't actually have the data in the first place. To explain this, I'll go through a basic process that I take. Just so that this makes sense, let's assume that your company is a building materials manufacturer that's looking to reach more individual building contractors within the UK. First you need to identify a data source. If you don't have existing data within a CRM or otherwise, move to step 2; otherwise skip straight to step 4. Identify online directories, such as freeindex.co.uk that has individual profile pages that local business contractors can advertise their business on. Crawl the directory using a tool like Screaming Frog SEO Spider to get a list of URLs of the profile pages. You should be able to filter out building contractors via the URL structure. Once you have these URLs, use data scraping to extract the business name, address, phone number and website. If you've never done any data scraping before check out this tutorial that I put together. 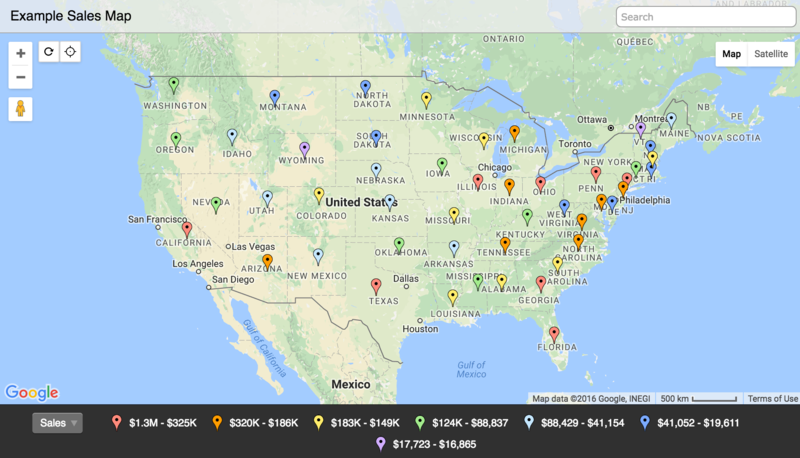 You'll now have a spreadsheet with all the data on your prospects. Clean up any formatting issues and go to BatchGeo.com. Upload the spreadsheet and let BatchGeo do the hard work of mapping the data points against markers on the map. Pass on the final visualization to your sales team. It's simple but really effective. Objective: Increase retention within your email list, while also increasing the volume of traffic to your website from email. How: I'm subscribed to less than a handful of email lists in total. The reason for this is that most emails I receive either aren't relevant to me or they don't add any value. If that's the case, why would I stay subscribed? I see hundreds of articles being published every day around "how to grow your email list", which is great, but barely anyone is thinking about what to do to keep those subscribers happy and engaged - both of which go hand-in-hand. The key to achieving this is a combination of matching the expectation of your subscriber and also delivering enough value to them via email for them to want to stay on board. The way that I approach this is that the subscriber should get unique value from being on your list. This is why I create whole blog posts that will only be sent to my email subscriber (they're not published anywhere else) so that you literally have to be a subscriber to view it. This adds a lot of value, and most of the feedback I get from long-time subscribers is around this fact. This is why I consistently get a high open and click rate on my emails (see above). Expectation-matching is another core part towards achieving this. I ensure that all of my subscribers are segmented based on the kind of topics they like to learn about. For example, if someone downloads my SEO Tactic Checklist then I know they want to learn more around SEO, so they're segmented into that bucket of subscribers and have a separate workflow of emails sent to them. Finally, you need to get the right balance of giving and extracting value. Email #2: Share useful content. Email #3: CTA to convert into customer. In the above example, there's not a huge amount of value being given before something is being asked of the subscriber. I actually have 8 individual emails that are sent to subscribers that add a bunch of value before I ask for anything in return. Those that reach the next email are highly engaged and will be much more likely to give me something back in return. I'm not saying you need to have 9 emails in all of your workflows for this to work, but you can see where I'm going with this. For every entry point into your list, add some kind of segmentation rule. For example, if someone downloads an ebook on a specific topic, tag them with that topic in your list. Build out a simple workflow for each topic segment you have (3-4 will be more than enough) that adds value outside of your website and other web properties. Add some kind of feedback loop into your workflow. This could be a short survey you ask people to take so that you can better understand what they want (make sure you've added enough value before you start asking for this). Add in a CTA to convert only when you've added significant value to your subscriber. Don't stop once they've converted. Email is a great retention tool - use it! Objective: Grow customer referrals and increase your organic search engine rankings and brand image. How: This is a little different from an all-out affiliate program, which I outlined previously, because this is highly targeted. Within an open affiliate program the goal is to bring in as many affiliates as possible to generate the maximum revenue possible. With an influencer campaign, the focus is around getting top figures within your industry to promote your product. Outside of the obvious benefits around generating new customers, there is a lot to be said for the effect this can have on your overall brand. It's one thing having a bunch of random bloggers pushing your product, it's another to have industry leaders validating that it's worth investing in. SumoMe, Noah Kagan's lead generation software company, run a focused influencer program where they will give referral fees to individual influencers that promote their product. They actually build out a special landing page for these influencers to direct traffic to, which is a great way to add a bit more value to them. In some cases they will even run specific offers for the influencer to use. 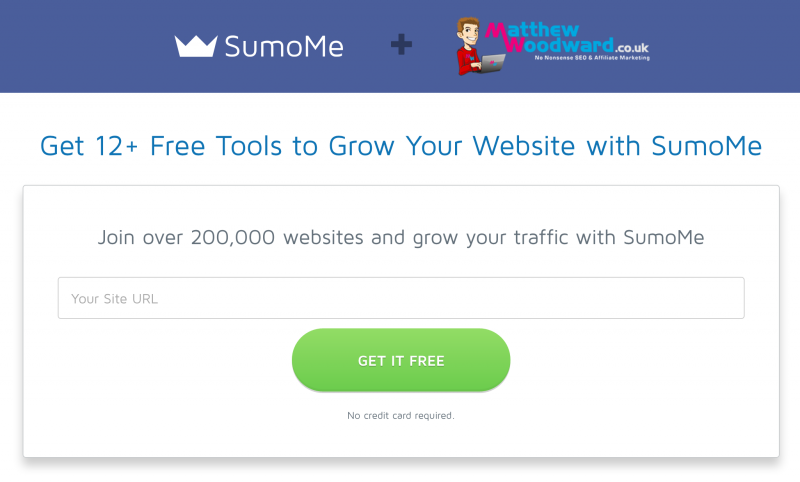 This is one of the pages that Matthew Woodward, a marketing influencer, uses to promote SumoMe. You probably noticed that I mentioned in the "Objective" section of this tactic that you can 'increase your search engine rankings' as well. Well, here's a nice trick that you can implement with these landing pages to boost the ranking of your product pages (or any page, for that matter). When you have a bunch of these unique landing pages for influencers, they're going to be linking to you fairly frequently, which will push a bunch of PageRank to these pages. Now that in itself is great but you probably don't actually want these pages to rank at all. Add a canonical link on each of your influencer landing pages that points to one of your product pages that you want to rank better. Now, all of those links to these landing pages will be pushed through to your product page and you should get a nice ranking boost. Just looking at SumoMe as an example and you can see there's over 9,000 backlinks from over 150 domains that point to these landing pages - a quick canonical tag will push all that lovely PageRank into a page you care about. Put together a spreadsheet with the names and contact information of a number of top influencers within your industry. Individually reach out to them and outline what you're looking to do, stressing the exclusivity, and what they're going to get in return. Work with each influencer to put together a custom package. Create assets for each influencer, including a landing page, creative and any offers. Run an initial campaign with each influencer to show them initial value in the partnership. Spend a lot of time hand-holding and maintaining the partnerships you form. Objective: Boost organic search traffic to high-value commercial pages on your website. How: One of the big challenges that a lot of businesses face with SEO is actually getting their product pages, or other commercial pages, ranking well for highly competitive search terms that can result in a large volume of conversions. It's one thing ranking blog content for long tail keywords that can drive leads; it's another thing ranking your product/service pages for highly competitive head keywords that can create direct revenue conversions. The reason for this? Commercial pages, like product pages, aren't very linkable. It's much easier to acquire backlinks to your top-funnel blog content than it is to your product pages. Unfortunately, backlinks are incredibly important towards ranking for highly competitive commercial keywords. This is where content flipping comes in. The basic principle behind this technique is to build out blog content that is highly related to the core commercial keyword you're trying to rank your product page for. For example, if you're trying to get your product page ranking for "accounting software", then the blog content could be something along the lines of "11 Questions You Need to Ask Before Choosing Your Accounting Software". Once you've built out a bunch of blog content, spend time promoting and earning backlinks to it. As I mentioned above, it's much easier to get links to top-funnel content like this. 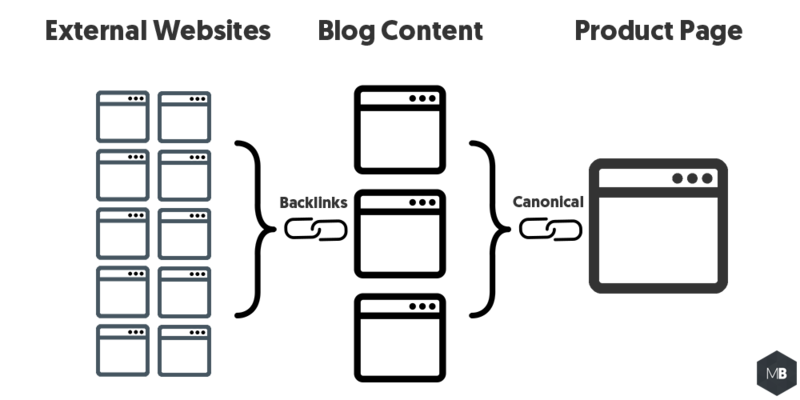 Finally, add a canonical tag from each of the blog posts through to your core product page. By doing this, you'll pass on all the SEO benefits of the links these articles earn through to your product page, enabling it to perform much better in the search engines. You can also go through existing content on your site that is relevant and push a canonical tag onto them that points to your product page. One thing to be aware of is that any page with a canonical tag pointing to another page will not rank in the search engines. This is all about helping your product pages rank - and it's seriously effective! One tip here is to focus your blog content that you 'flip' into your product pages around news-driven topics. Topical news content often generates the most links, which will give you a ton more PageRank to push through to your important pages. Thank you for the tips… I will even use to advertise my blog too! Excellent blog. This blog has a lot of information regarding my needs. I’ll defenately put it to good use. Incredible post, Matt. I appreciate it! This is a great post. Just not sure about the Content Flipping one. Seems somewhat deceptive and risky. Google may not look favorably upon that. Hey Jim, content flipping is essentially content consolidation. This is a relatively standard practice when you ave two individual pages that are competing in the SERPs with one another to then redirect or canonical one into the other to consolidate all the link signals. This is exactly the focus of content flipping, albeit with the focus of consolidating link signals from the outset. What I would say here is that if you’re not comfortable using a tactic, or have any doubts, then don’t do it. I’m presenting approaches that I’ve personally tested and ave found to yield results. Some will work in your specific situation more than others, and you also have to take into account what you’re comfortable doing. A lot of people have similar feelings arund website acquisition (tactic #6). #21 is a TERRIBLE idea! I would never do this for one of my clients and advise all readers of this post to steer clear of that. Hey Logan, interested to hear your reasoning. This is something that I’ve personally tested with great success a number of times and it works really well, so interested to hear your thoughts. Content Flipping is my favorite tip from this list. It’s something I am planning to do it on https://vanila.io and I am really excited to try it. Canonical tag, seems really easy. First of all, links pointing to pages that aren’t indexed (as you mention, canonicalizing one page to another will remove it from the index) are far less valuable than links pointing to indexed pages. Second, it’s just plain shady. If Matt Cutts were still in the game, he’d shut this tactic down in a heartbeat. It’s incredibly deceptive and a blatant attempt at gaming Google’s algorithm. Just because Cutts isn’t a decision maker, doesn’t mean they don’t have people looking out for stuff like this. If good ranking were this easy, what’s to prevent an ecommerce site from canonicalizing their homepage to their most profitable product? Third, you’re devaluing content that was (at one point) valuable enough to attract links. Why would you want to get content like that removed from the index? Secondary content, supplemental content, and information content that you find on blogs has value in and of itself, which is taken away one you remove that from the index via ‘content flipping’. Fourth, if you’re using this as a way to consolidate the content on your site, there are much better white-hat ways to do so. Fifth, by de-indexing these pages, industry authority is diminished. We all know that being an ‘authority’ has immense value in the eyes of Google, it’s best to keep that intact by having indexable content that demonstrates this. As we’ve learned time and time again from stories of penalties, deception is a game of short-term gains. It might be working for you now, but it’s not a sustainable practice and one you’ll most likely have to undo at some point. 1. Regarding the issue you raised around links being devalued from ‘canonicaled’ pages: this isn’t the case, or at least to the extent that you’re implying. Similarly wth 301 redirects, a canonical tag passes all of the link signals to the linked page. Gary Illyes was talking a little around this recently (source). The use of the canonical tag in large e-commerce stores is incredibly common due to page duplication so this isn’t really an uncommon thing. 2. This is a valid point. I’m not going to act like this tactic isn’t borderline, but I’m also very sceptical about Google ‘shutting it down’ because there are legitimate reasons as to why you’d want to do this. The e-commerce example you gave made me laugh because I was literally chatting about this with someone the other day (I’ve seen this done). I wouldn’t advocate the e-commerce example but I also know that a lot of seasonally reliant e-commerce stores use that tactic a lot. Again though, point taken on this aspect. 3. The whole point here is the prioritisation of your goals. I would never recommend taking a genuinely useful piece of content that you’re seeing great results from and then just flipping it into your product page for the sake of it. If your main business goal is to drive product signups and the top conversion channel for them is via commercial keywords coming to product pages then this decision becomes a lot more favourable. What I’m not saying is, “flip all of your blog content into your product pages”. Instead, if you’re main objective is to boost organic traffic to your product pages (or any page for that matter) and you ave a bunch of content that has links but offer little else, then go with this. 4. Care to elaborate? For me, it’s either canonical, combine, update or redirect (more info). 5. If we’re talking about strictly SEO here then your authority isn’t diminishing at all, because you’re redistributing link signals. I’m guessing though that you’re referring to just ‘losing’ a load of content. In that sense, I agree, but I’ll defer back to point 3 for the answer here. Hope this gives a little more clarity. Oh man… there’s 10x content, and then there’s this. This has given me a tonne of ideas to test. Glad to see you’re blogging again Matthew – will share any results I generate from trying these! Amazing! Thank you for sharing I found it useful. 1. Would you recommend copying the content from the blog post over onto the product page? Or not necessary? 2. If the blog piece is ranking for certain keywords, have you found that the product page will then rank for those keywords (or similar)? 3. What kind of news content are you referring to here? And how would you recommend earning links to the news content? Contacting reporters? 1. No. Keep the content on each page separate. 2. As long as the product page is highly relevant then it’s likely to capture the rankings of the blog post. Note that this doesn’t always happen like-for-like. The less similar the two pages are, the more likely that the rankings may not completely pass over. My advice here is to evaluate whether the potential gain on the product page is worth losing the rankings on the bog post. 3. This was just one example, but I was referring to more ‘newsjacking’ types of content. Stuff that’s topical for a period of time and then becomes relatively useless. An example could be a data viz on Black Friday sales – and yes, the tactic for links would be press outreach. As always, Matt, I can count on your for valuable, useful tips, and actual case studies. Thanks for being clear and specific when explaining what to do, and not using SEO jargon or thinking everyone will understand what you mean when explaining a process. I continually come back to your blog for insight and motivation. Really detailed. I really liked the refurbish content technique and I can see this working for my website. Loved this post… 100% Value! I think everybody gets so bogged down with creating new content that their older gems slip out of sight. Simply updating older stuff and repurposing on different channels has helped me loads (and reduced the amount of new content I need). It’s very useful and good information. Glad to see more post from you. Thanks for this great list of tips! I’m glad to find some useful information about Quora and some good advises. Of course, it’s not for the one time reading. For james’ question above, why keep the content separate on the two pages? Why not just rank using the blog post, then put the content on the product page if it works and put the canonical tag? Excellent Blog. Thanks for this great list of tips! I’m glad to find some useful information about Quora and some good advises. Of course, it’s not for the one time reading.